The Ross Sea, Southern Ocean - A fire aboard the whaling ship the Nisshin Maru has forced the majority of the crew to evacuate. 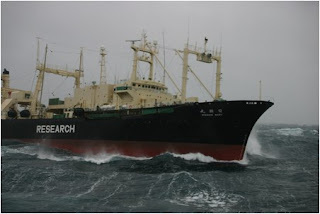 The vessel is a floating slaughterhouse and the flagship of Japan's illegal whaling fleet. The fire will likely halt Japan's whale hunt for the remainder of the season. 127 Members of the ship's crew were rescued by other ships. 20 Stayed aboard to fight the fire. The blaze was the second serious one to interrupt the Nisshin Maru's yearly hunt for endangered whales in the past ten or so years. The whalers were chased and collided with the anti-whaling ships operated by the Sea Shepherd Conservation Society last week, but those activists had abandoned their chase in order to refuel their boats. A Greenpeace vessel was headed for the whalers in order to document the hunt when the fire broke out.